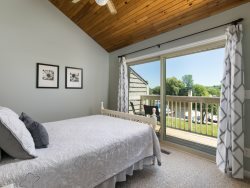 South Zoo is an economical family-favorite, dog-friendly vacation property that is close to all of the South Haven fun including the beach, playground, dining, shopping, and ice cream. Enjoy the fenced in big back yard ensure plenty of space for the group to spread out when they want. Did I mention there is Ping Pong in the garage as well? Make memories in the yard playing games, grilling dinner, making s'mores around the campfire, and playing fetch with the pooch. The house itself is simple and well laid out with 2 main floor bedrooms and the full bath as well as a large living and dining room with a large table for meals. The kitchen is not large but is equipped with everything you need to prepare meals. The upper level sleeping space is great for kids. The unfinished basement has a washer and dryer as well as a half bath and a separate shower room. Everything you need for a fun visit to the lake without breaking the bank. Bedroom 1: Main Floor. Queen. Bedroom 2: Main Floor. Queen. Bedroom 3: Upper Floor. 5 Single. Bathroom 1: Main Floor. Shower/Tub Combo. Bathroom 2: Lower Level. Shower Only. Separate Room with Toilet and Sink. Very close to everything. You have tv in basement on your Web but it is in living room which was a nice surprise. The only contact we had was making our reservation and the woman I spoke to was wonderful in assisting us in finding a shorter stay home that would take dogs. We had a wonderful vacation with our family! we stayed for three weeks. we had plenty of room! we had a great time! Thank you, Mark, for getting my last minute vacation off the ground within 2 days of my arrival! Mark was quick to respond to email or phone calls. Wonderful location, close to beach, town and park. South Haven beach has easy access, nice parking accommodations...my elderly parents could ambulate down toward the water on a boardwalk and set up chairs in the sand! Their first time in about 25 years! They were able to board a small boat at the maritime museum(BIG kudos to the gentleman at the museum who helped us) and take a tour of the marina...they loved it! House is well stocked, towels were new, kitchen items were nicer, too. There's lots of space so large groups can spend time all together or in smaller groups. Yard is large enough for games, grilling, lounging. Very neat and clean. Oh, and our dogs really loved that yard!! Everyone was very nice and extremely helpful. We had a great time. Lots of beds, clean and great location.